Since the 1950s, NORAD's Santa tracker program has been bringing kids cheer. (CNET) -- Last Christmas Eve, Jeff Martin found himself forced to explain to a Canadian general why, when Santa Claus passed through Toronto, Ontario, that night, Google Maps had placed the city in the United States. Martin, then a senior marketing manager in Google's Geo group, was part of a huge team of people involved in the joint U.S.-Canada North American Aerospace Defense Command's annual NORAD Santa tracker program, a long-running effort to provide children the world over a live view of Santa's progress as he and his reindeer deliver Christmas presents. In 2007, Google signed onto the project as a technology partner, and since then, has been incorporating NORAD's data on Santa's whereabouts into special 2D Google Maps and 3D Google Earth representations. And that's where the trouble began. Inexplicably, as Santa made his way through Toronto that night last year, the mapping software began identifying the city as being in the United States. Instantly, NORAD Santa's dedicated Gmail account "just lit up" with messages from irate Canadians, Martin said, and quickly, the Google team fixed the problem. But not before Martin's run-in with Canadian Lt. Gen. Marcel Duval. "He said, 'I understand that you have a new American city,'" Martin recalled. "It was a slightly tense moment for me, standing in front of a three-star general explaining to him why one of his cities had been designated as a United States city." All joking aside, NORAD has been taking its Santa tracking project seriously for decades. But it actually began in 1955 with a wrong number. One morning that December, U.S. Air Force Col. Harry Shoup, the director of operations at CONAD, the Continental Air Defense Command--NORAD's predecessor--got a phone call at his Colorado Springs, Colorado, office. This was no laughing matter. The call had come in on one of the top secret lines inside CONAD that only rang in the case of a crisis. Grabbing the phone, Shoup must have expected the worst. Instead, a tiny voice asked, "Is this Santa Claus?" "Dad's pretty annoyed," said Terri Van Keuren, Shoup's daughter, recalling the legend of that day in 1955. "He barks into the phone," demanding to know who's calling. "The little voice is now crying," Van Keuren continued. "'Is this one of Santa's elves, then?'" The Santa questions were only beginning. That day, the local newspaper had run a Sears Roebuck ad with a big picture of St. Nick and text that urged, "Hey, Kiddies! Call me direct...Call me on my private phone and I will talk to you personally any time day or night." But the phone number in the ad was off by a digit. Instead of connecting with Santa, callers were dialing in on the line that would ring if the Russians were attacking. Before long, the phone was ringing off the hook, and softening up, Shoup grabbed a nearby airman and told him to answer the calls and, Van Keuren said, "'just pretend you're Santa.'" NORAD uses four high-tech systems to track Santa -- radar, satellites, Santa Cams and fighter jets. Indeed, rather than having the newspaper pull the Sears ad, Shoup decided to offer the countless kids calling in something useful: information about Santa's progress from the North Pole. To quote the official NORAD Santa site, "a tradition was born." From that point on, first CONAD and then, in 1958, when NORAD was formed, Shoup's organization offered annual Santa tracking as a service to the global community. A phone number was publicized and anyone was invited to call up, especially on December 24, and find out where Santa was. Manning those phones over the years have been countless numbers of Army, Navy, Air Force and Marine Corps personnel and their families, and for many people, turning to NORAD to find out where Santa is became something to look forward to each year. These days, of course, a single red phone isn't enough to handle the demand for the information. In fact, said Joyce Frankovis, the public affairs specialist who runs the Santa tracking program for NORAD these days, there were fully 1,275 people involved in the project in 2008, and there would have been more had there been more room for them. Frankovis explained that most of those people are volunteers who come in to NORAD's Colorado Springs headquarters on Christmas Eve to answer phone calls and e-mails. And it's a good thing there's so many, she said, because "Literally, when a volunteer puts the phone down after they get done with a call, it's ringing again." All told, she said that each volunteer handles about 39 calls per hour and that in 2008, the team used 100 phones and 25 computers to handle 69,845 calls and 6,086 e-mails from more than 200 countries. Most of those contacts happened during the 25 hours from 2 a.m. on December 24 through 3 a.m. on Christmas that the operations center is up and running. Most people, Frankovis said, just want to know where Santa is. And so the volunteer answering the question will look up at the big screen on the wall at the operations center and see where, on the map that is integrating geographical information from NORAD with Google's mapping service, Santa is at that moment. "NORAD uses four high-tech systems to track Santa -- radar, satellites, Santa Cams and fighter jets," reads the NORAD Santa Web site. "Tracking Santa starts with the NORAD radar system called the North Warning System. This powerful radar system consists of 47 installations strung across the northern border of North America. On Christmas Eve, NORAD monitors the radar systems continuously for indications that Santa Claus has left the North Pole. Canadian NORAD fighter pilots flying the CF-18 intercept and welcome Santa to North America. "The moment that radar indicates Santa has lifted off, we use our second detection system. Satellites positioned in geo-synchronous orbit at 22,300 miles from the Earth's surface are equipped with infrared sensors, which enable them to detect heat. Amazingly, Rudolph's bright red nose gives off an infrared signature, which allow our satellites to detect Rudolph and Santa. 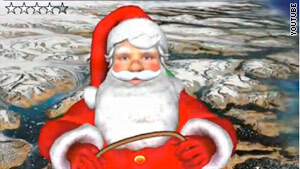 "The third tracking system is the Santa Cam network. We began using it in 1998, which is the year we put our Santa Tracking program on the Internet. Santa Cams are ultra-cool, high-tech, high-speed digital cameras that are pre-positioned at many locations around the world. NORAD only uses these cameras once a year on Christmas Eve. The cameras capture images and videos of Santa and his reindeer as they make their journey around the world. "The fourth system is made up of fighter jets. Canadian NORAD fighter pilots flying the CF-18 intercept and welcome Santa to North America. In the United States, American NORAD fighter pilots in either the F-15 or the F-16 get the thrill of flying alongside Santa and his famous reindeer: Dasher, Dancer, Prancer, Vixen, Comet, Cupid, Donner, Blitzen and, of course, Rudolph." Still, despite all that, "Santa is hard to track," said Frankovis. "We actually never know which route Santa's going to take. So it's just a matter of using that high-tech equipment to track him." Technology is also playing an increasing role in how NORAD publicizes the program. Frankovis said that after taking over the project earlier this year when her predecessor retired, she decided to begin using a much wider collection of social and online media for promotion. As a result, the NORAD Santa tracker now has presences on Facebook, Twitter, Flickr, YouTube and TroopTube. Google's Martin said that his company -- which, like all the corporate partners in the program, offers its assistance at no cost to taxpayers -- has dozens of people working on helping to track Santa. Those people provide technical consulting and server provisioning for the NORAD Santa Web site, as well as helping put together YouTube videos, information for Google Maps and Google Earth and, soon, a new service that will allow people to use their mobile phones to track Santa on Christmas Eve. All told, Martin said, the Web site had 8 million unique users in 2008, who visited the site 15 million times, accumulating tens of millions of page views and more than 10 million map views. Those numbers were up about 45 percent from 2007, he added. Martin also said Google helps out by providing and monitoring a Gmail account for the program. And it was there that one of the best messages he can remember came in just a few days ago. "I have been good," a girl named Stephanie wrote to Santa. "But my brother Christopher is mean to me. Take him and leave the presents, please!" Martin said that, clearly, many of the kids who send e-mails think they're reaching out directly to Santa. "We'll write back and say we've forwarded their message to Santa at the North Pole, who's preparing for Christmas Eve." Of course, not everyone believes in Santa. Frankovis said that some callers --especially towards the later part of Christmas Eve when maybe a little bit too much egg nog or a Canadian grog called Moose Milk has been drunk -- dial in to have a little bit of fun. But for those who question whether there really is a Santa at all, Frankovis said the volunteers answering the phone have a simple answer: "'We believe, based on historical data and 51 years of NORAD tracking information, that Santa Claus is alive and well in the hearts of people throughout the world." Last March, Shoup died, said Van Keuren. But in the years before his death, she and her family would take the retired colonel back to Colorado Springs each year for the Santa tracker training. "They would introduce him and he would say a few words," Van Keuren said. "So that was a big thrill for him." In his later years, Shoup "was not as sharp as he used to be," she said. But his days overseeing the Santa tracker program were still near and dear to his heart. She said the NORAD folks had printed out a sheaf of e-mails kids had written in and gave them to Shoup as a reminder of what he'd started back in 1955. "For the last weeks of his life, he carried them around in his briefcase like they were top secret papers," Van Keuren said. "Those were just precious to him. I'd read them to him over and over." © 2010 CBS Interactive Inc. All rights reserved. CNET, CNET.com and the CNET logo are registered trademarks of CBS Interactive Inc. Used by permission.